After three nights in Florence, it was time to return to Rome where we would spend another night before catching a plane out of Italy. We started the day with breakfast at the same cafe on the Duomo plaza. I’m a big fan of a simple breakfast of croissants and coffee, so that’s what I ordered once again. Then we packed our stuff, hauled our luggage down four flights of stairs, and through the streets of Florence back to the train station. By this time, such trips were becoming fairly routine. The train ride was easy. From my very limited experience on this trip, Europe just seems to do train and plane travel a lot better than we do in the U.S. Back in Rome, we stayed in the Hotel Torino whose main asset is being close to the train station. It was perfectly serviceable, but it was billed as a four star hotel — so I guess I don’t know what that rating entails. Certainly nothing to do with quality WiFi! But, we weren’t spending much time in the hotel anyway, so it didn’t much matter. Once we got our stuff up to the fourth floor rooms (elevator this time!) the first order of business was lunch. We ate at Er Buchetto. This place was fantastic for what we wanted. Just a quick, inexpensive sandwich to tide us over. The sandwiches were incredible — pretty much just pork on bread which we ate standing up at tables, which sounds awful, but when the pork is a delicious porchetta and the bread is great and the table you’re standing at is on a sidewalk in Rome, it’s the opposite of awful. I also had a Peroni because, why not? From there, we walked to the Pantheon. We had seen the outside on the first night in Rome but had arrived too late to go in. 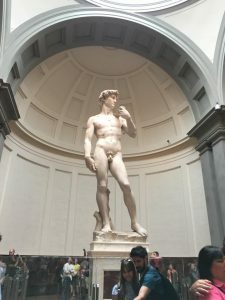 When we went in, I was a little surprised — but really shouldn’t have been: the many gods one expects with a word like “Pantheon” have been replaced by the one Christian god. I know the popes haven’t controlled Rome for the full 2,000 years of Christianity, but they have at least done so for a long time. It makes sense that the Pantheon wouldn’t remain dedicated to pagan Gods. Wikipedia tells me it was dedicated to St. Mary and the Martyrs in the 7th century. From there, we had yet more gelato, enjoyed some fountains, and made our way to the Capitoline Museums. This museum had been recommended by our tour guide for the Colosseum, and (in my opinion) it delivers. It sits atop the Capitoline Hill, has great exhibits, and was very uncrowded. 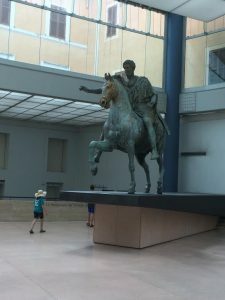 In particular, the huge statues of Marcus Aurelius and Constantine are impressive. And the length of time there have been people settled on Capitoline Hill is staggering. They had evidence of Bronze Age settlements there. It’s a good, defensible location on the Tiber connecting the Mediterranean to the interior of Italy, so settlement there makes a certain amount of sense. We cut this visit a little short — our Museum Tyrant was a little gassed (as was the family generally) and not insisting on seeing every room. A cozy little room with understated decor in the Capitoline Museum. So, we made the long walk back to the hotel and had a little rest before dinner. 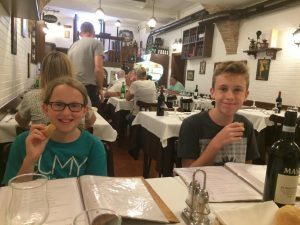 Our last dinner in Italy was at the Alessio — a nice restaurant down the street from the Hotel Torino with tables in the basement. Seemed to be a popular place for Americans. I had a mushroom and sausage pizza. But, Harper’s meal was probably the most interesting — it was a seafood pasta with things like oysters, clams, and shrimp on top of the pasta. She had to do a fair amount of work peeling and whatnot with her meal, but it looked delicious! I think I mentioned that traffic in Rome is like a perpetual game of chicken. At the crosswalks without lights, you have to kind of walk out into the middle of traffic and trust that cars will stop for you. And, they do stop. But for an American not used to this kind of thing, the level of trust it takes to walk in front of a fairly fast moving car is unnerving. Indecision will get you hurt. We were taking a stroll after dinner when we came upon one of these crosswalks. Harper kind of lost her nerve and her body was trying to go forward and backward at the same time, causing her to fall in the middle of the street! The rest of us were there and, so, the traffic was coming to a stop; so, nothing was hurt but her pride. Our last day in Italy began with breakfast on the roof of the Hotel Torino. I was moderately excited to see a self-serve coffee dispenser, since I had not had a large cup of coffee since our trip began. But, unfortunately, the coffee was not that great. After making ourselves some plates, we went out onto the roof. This was clearly the pigeons’ roof. We were mere visitors. The wait staff had to be quick to remove the plates and the tablecloth when a patron finished eating because those pigeons were going to be on the table quickly. I think at this point, Harper started rethinking her view of pigeons as cute and interesting and began gravitating more toward the “rats-with-wings” consensus. We took the Leonardo Train from Termini Station to the airport. There was a bit of trouble with the conductor as we had inadvertently not paid the fare for Cole. When buying the tickets we must have marked both kids down as “children” when 13 year old kids were required to pay full fare. Fortunately, the conductor chalked it up to a misunderstanding and we were able to simply pay the fare without paying the associated fine. Other than that, the train ride, checking bags, security, and the flight from Rome to Berlin were easy. I don’t know if we were lucky or if the Europeans are just better at this sort of thing than we are, but travel on trains and airplanes seemed to be much less of a hassle than I’m used to here in the U.S.
Once we got to Berlin, we were happy to see trees again. When I heard birds chirping again, I realized I hadn’t heard birds chirping while I was in Italy. The driving also seemed more civilized with cars giving each other more space and rules of the road being observed. We stayed at the Hotel 103 which was an interesting place. We initially had some trouble with the buzzer to get into the hotel. We rang the bell, the hotel staff buzzed to unlock the door, but we kept pulling instead of pushing. The guy came out and let us in, then observed that the door didn’t have a “push” sign on it and figured that was something he ought to take care of. The place almost has a feel of a cross between a hotel and a dorm or hostel. The lobby is more hotel like whereas the bedrooms are definitely more dorm-like. Our four bed bedroom was just a long, narrow room with four single beds lined up in a row along the wall with a small table separating each one. There was a table in the corner with a 12” TV. The table was situated such that the bathroom door didn’t open up all the way. Making matters even more interesting, the lights wouldn’t turn on. After our inability to get in the front door, I was hesitant to ask the guy at the desk. But, we have to have light. Turns out there is a receptacle on the wall inside the room where you put your key card. This activates the lights. It’s an energy saving strategy. The front desk guy said it’s on his list of things he tries to remember to tell Americans because we’re apparently very often unfamiliar with the concept. We also asked for restaurant recommendations. 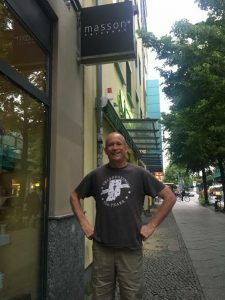 He offered us a variety of cuisine types, but — much as we like, for example, Thai food — we felt we should get some German food. So, he recommended Zum Bayernmichel which was a block or two away and fit the bill perfectly. 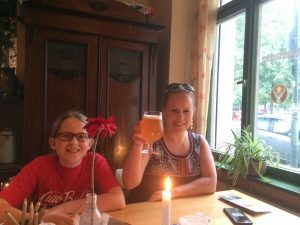 He said his wife — who grew up in Germany — described it as the sort of comfort food her grandma might make. The owner was so friendly. He was so enthusiastic whenever I’d order, I felt like I’d done something really good! I honestly can’t remember what I ordered. It was big, heavy, tasty, and made of some part of a pig. I mostly remember the cole slaw which was all kinds of delicious. And, I had some German beer. Again, I don’t remember what it was – but it was listed as the house beer. A pilsner of some sort. Based solely on the location, I assume this is a reference to David Hasselhoff. While we were in the restaurant, the only rain of the vacation began. It came down heavy, but was finished by the time we finished eating. 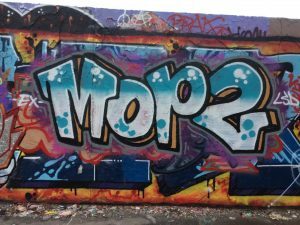 So, we took a walk to the Mauerpark where we saw some of the graffiti painted on remnants of the Berlin Wall. Max Schmeling Hall was also in the area, mainly of interest to me simply because I’ve heard the stories about the Max Schmeling – Joe Louis fights in 1936 and 1938 and his later friendship with Louis. The day started early because the sun rose at about 4:45 a.m. in Berlin. The trip home was smooth. We got a cab, took it about 7 miles to the airport, checked our bags, cleared customs, and ate breakfast in about an hour. Again, Europe seems to be a lot better at moving people than we are. Air Berlin, once again, seemed eager to feed us, giving us a couple of meals and a snack. I was seated behind an aggressive recliner. But, all in all, the flight wasn’t too bad. The entertainment systems on board are pretty remarkable when you compare the situation 10 or 20 years ago. A few dozen movies to choose from, plus TV shows, music, and games with a console at each seat. Our biggest challenge on the return was that the review mirror had become detached from the window. I think it was an add-on mirror (with fancy pants temperature gauge and compass) and the adhesive that held it up had given way. The parking facility where we had our car helped us out with some duct tape to keep it from dangling from its wires. Other than that, there were no problems getting home. The jet lag was definitely easier to deal with, returning east to west, when compared to the return from our Hawaii trip, coming the other way. As it turned out, with the early sun rise in Berlin and the late sunset in Indiana, we had about 22 hours of sunlight. Sad to have our trip end, but happy to be home. 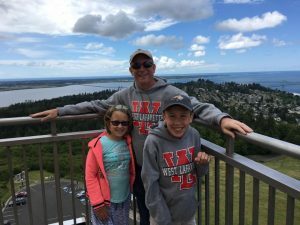 Me and the kids on top of the Astoria Column, June 2016. Today on Facebook, I made a post that said, “it’s Father’s Day, and I enjoy being a Dad.” Upon further reflection, “enjoy” doesn’t quite capture it. I do enjoy being a Dad most of the time. Occasionally not. But the significance of being a Dad for me is bigger than whether I enjoy it. It’s difficult to describe, particularly because I don’t really know what I’d be like if I never became a father. But, I feel like it has made me more substantial as a person. This is a consequence of having a large responsibility and doing my level best, over a sustained period of time, to fulfill it. The returns on the effort are fantastic. The kids have gone from little bundles of perpetual neediness to full blown people whose company I really enjoy. If it weren’t for family life, I feel like there’s a good chance my life would lack a lot of the depth I feel like it has now: working, drinking, golfing, and playing video games are fun for awhile, but they only take you so far. And, for what it’s worth, I’m speaking only for myself here. I’m sensitive to the fact that people have not had kids for a variety of reasons (e.g. can’t or have decided that’s not the choice for them.) Many of them, from what I can tell, are living lives that are plenty rich and deep. (For that matter, I’ve seen guys who are technically fathers but don’t seem to give a damn). But, for my part, I’m skeptical about what my life would look like now if I had not gone the family route. They make me better. Not having a plan for the rest of the day, I went with my now standard approach of looking for a green space on the map and heading there. This time it didn’t work out for us. We headed for Cascine Park on the west end of town. The walk took us through what felt like a sketchy area of town, then the park itself — at the edge where we entered anyway — was pretty shaggy and didn’t have many people there. One kid riding a bike past us seemed to ride unnecessarily close to Cole, like he was trying to provoke a reaction before he avoided contact and moved on. I think if we had made it to the center of the park, we would have seen more people and more of interest. But, the place was giving us a bad vibe, so, we turned around before getting to anything much. It ended up being a pretty long walk (4 – 4.5 miles) for not much payoff. On the walk back, Amy and the kids got some gelato and I got a Peroni, so it wasn’t all bad. Admiring the understated architecture over breakfast. I’m not sure how much the kids took away, but while we were learning about the construction of the Dome itself, I was very insistent to Cole & Harper about how the Dome was the kind of thing that started the scientific revolution. In particular, it seems to have been one of the points where people of the day recognized that they could not only match the feats of Rome, they could surpass them. The mindset that humans can make the world better than they found it is very important to me and hopefully will be to the kids as well. I think there is some level of irony to the idea that the people of the day were teaching themselves about things like math, physics, and perspective in an effort to create works that would better glorify God but the scientific revolution that resulted lessened the relative importance of religion in day-to-day life. I was also very interested to learn that Bruneschelli who designed the dome got his start (in part) as a clockmaker. Another exhibit that I found moving was “The Deposition” by Michelangelo. It was one of his Pietas, carved when he was nearing the end of his life in his 70s, intending that it would be placed at his tomb. He became frustrated with a flaw in the marble and attempted to destroy it. (Although there is another theory that the imagery he used would identify him as identifying with a group of Christians who were out of favor with the Church.) The face of one of the figures in the sculpture is said to be a self-portrait of Michelangelo himself. During this trip, Harper earned the title, “Tyrant of the Museum.” She had very definite opinions on which room we should go to next. 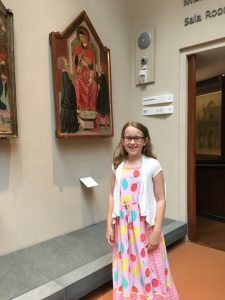 She wasn’t trying to hurry us from one room to the next — rather, she was trying to make sure that we worked through the museum methodically so she didn’t miss a room. Later, in the early afternoon, we climbed the ~450 steps up to the dome. Everyone did fine. Amy was a little concerned that she’d get nervous with the heights, but it didn’t seem to be an issue. (Unlike the Astoria Column last year in Oregon which looked to be pretty nerve racking.) The views were, of course, spectacular. We celebrated the climb with some wine and sodas at yet another street side cafe. On the other side of the street, there was a busker playing an accordion. We had seen him in a number of locations over the two days we had been in Florence and loved his music. Harper took some coins to put in his cup. Buskers are fine, but there were also a number of beggars in the street who were not so fun to be around — they generally gave the impression of being grifters rather than simply people down on their luck. Later in the afternoon, we made it into the Cathedral itself. We had seen parts of it as we climbed the dome but had not yet seen it from the ground. It’s impressive for sure, but it doesn’t take a lot of time. The line to get in can be fairly long, but generally it moves pretty fast. We wrapped the day up with dinner at Club del Gusto. One website said it was open at 6 p.m., but apparently they didn’t open for dinner until 7 p.m. (While we were waiting, Cole took the opportunity to pick up a Juventus soccer jersey from a nearby vendor.) On the way to the restaurant, we saw a line for a restaurant called All’ Antico Vinaio which was significant enough that, when we got back, I felt the need to look up what the hell was going on. From the reviews, it looks like wine and killer sandwiches for not very much money. 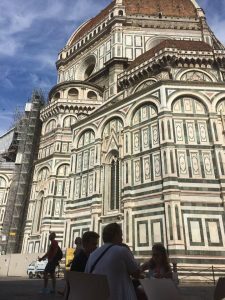 If we ever make our way back to Florence, we’ll have to check it out. After three nights in the Rome apartment, we were ready to head to Florence. First we had to clean up the apartment and get breakfast. Dealing with trash is apparently a bit of an ordeal in Rome. We didn’t have much of it, but we had to walk it 3 or 4 blocks to a trash receptacle (only available during particular hours). Fortunately, there was a nice cafe nearby. (There’s *always* a nice cafe nearby). In this case, it was the Caffe Lungara 1940. I had a double espresso and a croissant. Amy had a cappuccino. Italian coffee culture is different from ours. We tend to drink more at one time and linger over it. I’m told Italians are more likely to drink it in smaller, more concentrated doses and stand over a bar to do it. The cappuccino is almost entirely a morning drink since it has milk in it. I’d never had espresso (double or otherwise) before. I enjoyed it — but, then I like my coffee strong anyway. The place had a retro decor. (I guess “retro” is relative in a place as old as Rome — think “Beatles albums on the wall.”) It also seemed to have more than its fair share of English speaking patrons. The staff was very friendly. 12/10 would recommend. Train, train, take me on out of this town. 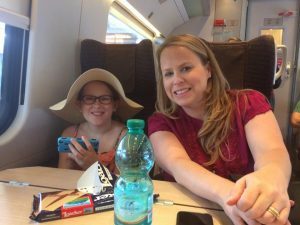 After a breakfast, we took a car to Termini Station which is the central train station for Rome, serving both the local trains and the regional trains. The news ticker on the TVs at the station were full of news about Trump’s abandoning the Paris Accords on climate change. The quote running was “Trump refuses the future” which, I suppose, tells you what you need to know about Europe’s view of the U.S.’s political situation. That said, the people we met did not seem to associate us with our country’s political situation. I can’t think of anybody who was anything but nice to us. A somewhat unexpected aspect of Termini: pay toilets. That’s a seller’s market, so we paid the price! The train system was remarkably smooth. Mussolini may be gone, but the trains still ran on time. Everyone here should take the Rome to Florence train to see what’s possible. Compared to that ride, the Lafayette to Chicago train might as well burn coal and use a cow catcher. Indianapolis to Chicago would involve denser populations in both cities at a distance that is not terribly longer. We could do this if we wanted to. The Rome to Florence trip took 1.5 hours. The shorter trip from Lafayette to Chicago takes at least double that. Some random thoughts about the trip: I was a little surprised to find that my ears popped from pressure as we headed through tunnels. After reflection, I realized the train was acting like a piston when it went through the tunnel, so of course the air pressure would increase. The arid countryside between the cities reminded me a little of the Western Slope areas in Colorado. Finally, a warning sign on the train window told you that, in an emergency, you should break it with the Martello di Emergenza (“Hammer of Emergency”) which I think would make a good band name. 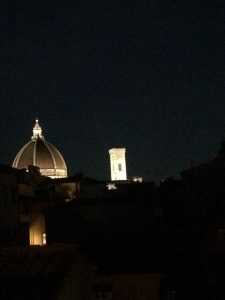 After hitting Florence, we dragged our luggage ¾ of a mile to our apartment on Piazza San Marco then up the stairs to another fourth floor residence. We didn’t have plans, so I was tasked with coming up with something. I found more green space. In this case, it was the Boboli Gardens which were across the Arno River and up a *steep* hill. The family called it “another one of Dad’s death marches.” Cole used the term affectionately. The rest of the family less so. On the way, we stopped at a little sandwich shop called Sogni E Sapori. Cole and I had sausage sandwiches that were delicious. 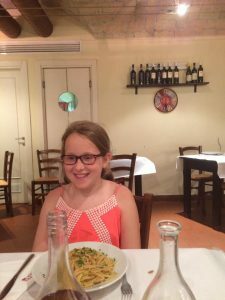 The girls had pasta which got the job done, but Amy strongly suspected it was warmed up in the microwave. Too bad there wasn’t anything pretty to look at on this trip. When we arrived at the Gardens, we hadn’t necessarily expected an entrance fee, but the fee was well worth it. Initially, where we entered wasn’t too impressive — a path through some corridors of bushes, but then it opened up to (yet another) incredible view. What was more, there was grass! The kids went barefoot. We had spent too many days with footwear on cobblestones. Because I’m 12 at heart, I cracked myself up looking at a statue that I affectionately referred to as Neptune’s Bidet because of the position of the fountain in relation to the statue of Neptune in the pond. After wandering the park for awhile, we came to a broad clearing without many people and just relaxed, enjoying the day. Cole and I sat on the ground in the shade. Amy and Harper sat on a nearby bench. Eventually both of them were laying down on the bench. 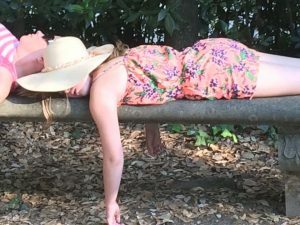 And then Harper was dead asleep on the bench. Travel takes it out of a girl! Probably this has something to do with the Bonine she took to avoid travel sickness on the train. (We have a nice collection of photos of Harper sleeping in various places during the vacation.) Leaving the garden, we stopped for gelato before our long hike home. 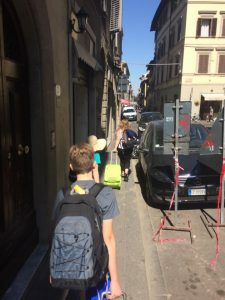 One of my favorite stretches of Florence was the Via Romana running along the northwest edge of the gardens down a long hill to the Ponte Vecchio — a bridge over the Arno River with shops lining the edges. The Via Romana has an incredible array of shops and restaurants and all kinds of activity. Impressive as the selections were, we were a little beat for dealing with a restaurant that night. So, we went to a grocery store not far from us. It had an impressive amount of stuff in a not very big space. It must be a challenge to supply these cities with such narrow streets and fairly cramped spaces. Being this old, the cities simply weren’t designed with cars and trucks in mind. That said, the streets of Florence were, by and large, less cramped than the streets of Rome. Our apartment in Florence wasn’t quite as swanky as our apartment in Rome, but we didn’t need a lot. This one had a small balcony with a view of the Duomo which was a really great view as we drank our wine and ate our meat and cheese to wind down the night. There were a lot of street noises. We were above a bus stop and, just generally, there is a lot going on. The ambulances are pretty frequent. And, at least on Saturday night, there was a happening party on a rooftop terrace a few buildings down from us. Sounded like they were having a great time. Also, they liked Led Zeppelin. We all slept in after our Colosseum tour. By the time we woke up and got moving, it was lunch time. We didn’t have any timetable that day, so it was all good. We ate lunch at a cafe (salmon pizza for me!) before heading out over to Castel Sant’Angelo which you could see from the terrace of our apartment. Before we entered, Harper browsed one of the ever-present merchandise stands to see if there was anything she wanted. 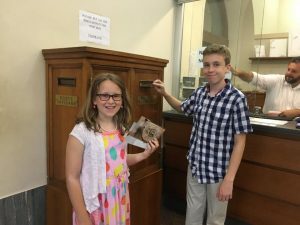 She had received some surprise money from grandma before the trip and was wasting no time in finding something she liked. She got a jaunty sun hat that served her well throughout the rest of our trip — there being no lack of sun. Near the top of the castle, there is a little bar with outdoor seating. Amy snagged us the best seats in the place — a table with a great view of St. Paul’s cathedral. At the top of the castle, there are some ridiculous views of the city and the Vatican. As we made our way back down and out of the site, there was a running fountain that I used to fill up a water bottle. (In a number of places in Rome, you’ll see running fountains. It’s my understanding that the water is generally potable.) From then on, I raved about the quality of the “castle water” which turned into a running joke about how I would never drink anything else — the kids came up with a plan where we could send them in (admission being free for the kids) to secure my castle water. The repeated flights to Rome might still get a little expensive. From there, we walked about a mile to the Spanish Steps. 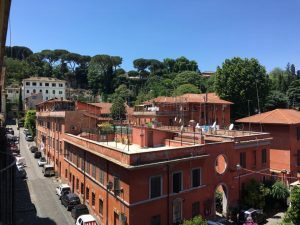 There are 135 steps that climb a steep hill, originally intended to link the Bourbon Spanish Embassy with the Trinita Dei Monti church at the top. The Steps are, of course, a popular tourist attraction where I heard many different languages being spoken. As I was listening to the many languages of people enjoying the Steps together, I had the not entirely original thought that the average citizens of the different countries often have more in common with each other than they do with the leaders of their respective countries. The conflicts, such as they are, have more to do with those leaders than they do with ordinary people. (As it happens, this was a theme in some World War I literature, suggesting that the German soldier and the British soldier would just as soon have a beer together as kill each other. It was the upper classes who had a beef with one another.) The Spanish Steps’ impact on World Peace is debatable. What’s not debatable is that it’s valuable real estate where the nearby gelato stand feels comfortable charging an arm and a leg for subpar service. A block or two away and the prices go down and the quality of service goes up. Lesson learned! Cole declared that he was going to “sit the heck out of those steps.” And so we did. We found a nice step in the shade and did some people watching. The whole trip was full of fantastic people watching. 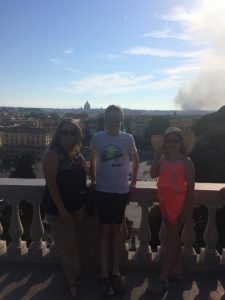 The smoke in the background by the Vatican is not a return of Charles the V sacking the city — apparently there was an auto junkyard that caught fire. 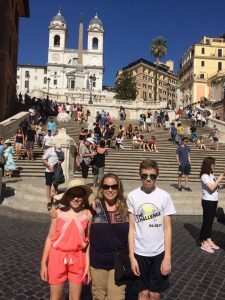 Seeing the Spanish Steps was the end of our planned itinerary for the day. I noted some nearby green space on the map which turned out to be the Villa Borghese Gardens, so we headed there. Rome is a place largely devoid of vegetation. The place is almost entirely stone of one kind or another. Cole kept having a sore back that I think was due to doing so much walking on such hard surfaces. So, the Villa Borghese Gardens which has some green space was a nice break from the stone. There was an overlook onto a divided highway that Cole and I found hypnotic, having something to do with the pattern of traffic climbing a hill with the ever present scooters and motorcycles weaving in and out of the larger cars. But that wasn’t the main attraction at the gardens. Rome being full of cool stuff situated among hills, there is never a shortage of spectacular views. The Gardens provided yet another one at the top of “the Pincio” which is the Pincian Hill, close to but not one of the original Seven Hills of ancient Rome. We didn’t explore the Gardens with any thoroughness because we were distracted by another shiny object. Down below the Villa Borghese Gardens, from the overlook, we saw the Piazza de Popolo which is *huge*. The middle is dominated by the Flaminio Obelisk, an obelisk carved in Egypt sometime in the 1200 BC range during the reigns of Seti I and Ramses II. It was brought to Rome on the command of Augustus Caesar in 10 B.C. Torn down and broken into several pieces, it was re-erected in 1589 during a re-urbanization plan of Pope Sixtus V. (The overlap between modern Rome, papal Rome, and imperial Rome was always creeping up on me. Each of those stages is hugely significant on its own, but seeing them layered one on top of another represents a depth of history I’m not used to.) On opposite sides of the plaza are statues of Neptune and Dea Roma (which I originally took to be Minerva). We noted with some irony that Dea Roma’s fountain was more impressive than the God of the Sea’s fountain. The face of a girl who is happy about her order. We finished the day at a restaurant recommended by our friends called La Fraschetta Romanesca on the Trastavere side of the river. The store front is relatively small with limited seating on the ground floor, but then you go downstairs and it really opens up. Harper was *very* excited by her meal when it came. The whole family enjoyed the meal. (I followed up my salmon pizza from the afternoon with salmon penne.) A half liter of wine was only $6 while a similar amount of water was served up for $5 — so you do the math on what to drink! 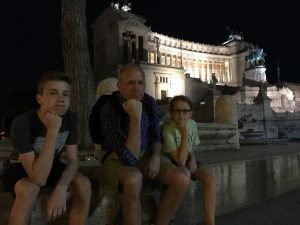 Aside from seeing the amazing sites of Rome, this really was quality family time. Being in a new place with language barriers all around and none of the distractions of day-to-day life probably had us more focused on one another and gave us plenty to talk about. In any case, the dinner at La Fraschetta Romanesca ended another busy day in Rome. I think we did pretty well for ourselves without a formal itinerary. Amy had secured tickets for us online for entrance to the Vatican Museums. This was a great move because the lines to get into the place looked extensive. It was a self-guided tour where they gave you a little device where you would punch in the number of the exhibit, and it would give you information about the exhibit. Ultimately, we used the devices some but not very much. 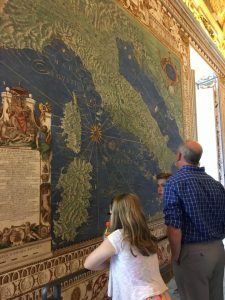 Enjoying a historical, wall sized map mural with my kids. As one does. sections of Italy all along its length. I can’t stress how much I love maps. The family thought they lost me. On the way back, we walked around St. Peter’s Square and then stopped into the little grocery near our apartment and braved the language barrier to acquire more meat, cheese, and wine. 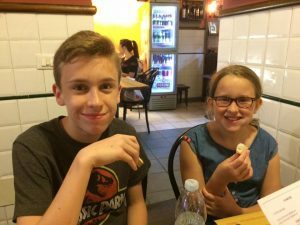 We had a snack and rested awhile before venturing out again later in the day for a night tour of the Colosseum. On our way to the tour, we very randomly ran across a fellow lawyer from Lafayette. He and his wife were meeting up with his son who lives in South Africa. Rome was kind of a mid-point for them. I had no idea he was there. We were walking down one street toward the Colosseum. He was walking up an intersecting street from a church they had just visited. I kind of squinted, thinking there was no way it was him. But, sure enough it was. I called out, “Hey Jeff!” causing him to do a double take of his own. Small world! We had time to grab a quick pizza at a place near the start of our tour. It looked like it was going to be a bit of a tourist trap, but the pizza was unexpectedly good. Probably the best I had the entire time we were there — it was a sausage and mushroom. I regret that we only got one. Dining is usually a slower affair in Rome, and we were under a time crunch to get to our tour on time. They got it out to us quickly, and the family inhaled it. We could have handled a second one! At the beginning of the tour, we were all given headphones and a transmitter that allowed us to hear the guide without having to crowd her. The tour guide was, I believe, an archaeologist of some type. She definitely had strong opinions about the National Monument to Victor Emmanuel II. I don’t know if she actually used the phrase “white monstrosity,” but that was the general thrust of her comments. It’s a massive pile of “corpse white marble” that tore up a big chunk of Capitoline Hill and covers up a fair amount of the Roman Forum which could otherwise be unearthed. 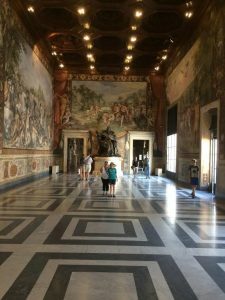 The tour took us past the Capitoline Museum which she recommended as having material of comparable importance to what you find in the Vatican without anywhere near the crowds. From there, we made our way to the Colosseum. It’s a massive and fascinating structure. I think it held about 80,000 people. They unearthed a great number of elevator shafts and our guide described how slaves used pulleys to haul animals, gladiators, props, and a number of other things up the elevators. This was about the only reference to slaves I happened to come across while we were in Rome — which is a little disappointing since so much of imperial Rome was made possible by the extensive use of slaves. 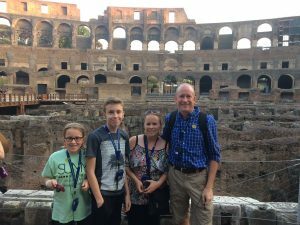 Under the Colosseum, it was dark and there was a balancing act between light – which required use of some pretty foul torch fuel — and being able to breath. Also, there was a lot of wood used for the floor of the Colosseum, meaning there was a non-trivial chance of getting caught in a fire. Rome had been a city of a million people and, after the Empire collapsed, had a population reduced down to about 30,000. Cole and I had a good conversation about what that must have been like — living in a place where you are daily confronted with evidence of a previous civilization where there were a lot more people who could accomplish things far beyond your capabilities. There was also a period where, apparently, rival families warred for control of the Colosseum. After the tour, we walked back and grabbed some gelato on the way. The daily gelato stops became a happy routine for us. By the time we got home, we had walked something like 28,000 steps for the day. Amy and I finished the night with wine on the terrace. Then I crashed hard, sleeping until 10:30 in the morning the next day. I’m probably overthinking that night’s sleep, but it seems to me that after an extremely busy April and May, the effort required to square away work enough to go on vacation, the effort of getting packed for vacation, the flight, the early morning at the Vatican, and the thousands of steps the day before, my body was serious about getting some sleep. 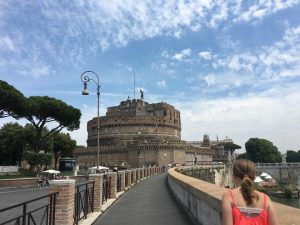 Next time: Part III – Castel Sant’Angelo, Spanish Steps, Villa Borghese Gardens, Piazza del Popolo. It began, as all great tales do, as a love story. In this case, the love of incredibly cheap airfare! 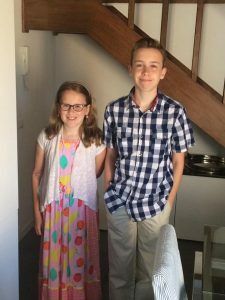 The kids are 11 and 13 which is a great age for traveling: old enough to be largely self-sufficient, but young enough to still enjoy our company. 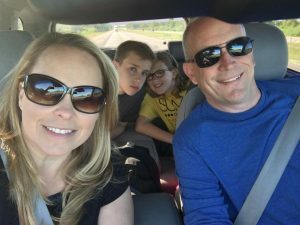 We knew generally that we wanted to take them to Europe so they would have at least a little context for the world outside of the the United States. Italy, along with Ireland, Spain, Germany, and England were potential destinations. Amy, being an inveterate planner, downloaded an app called “Hopper” which monitors airfare. We knew generally the dates we were interested in and the destinations, so she could keep track of bargains that might arise. During this period, we were hemming and hawing about where to go. Then, one day, she sends me an e-mail. 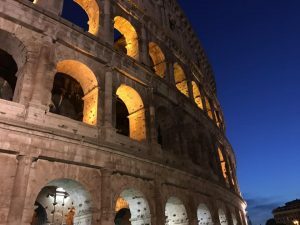 Hopper alerted her to an AirBerlin flight to Rome, round trip, for $411. The “downside”: we have to spend a night in Berlin on the way home. Oh no! Our decision was made. At those rates, we could spend less on our entire vacation than we spent on airfare alone during a vacation to Hawaii a couple of years ago. 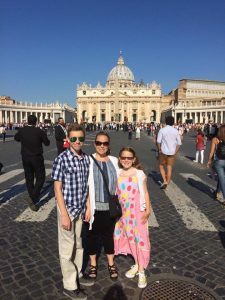 We decided to spend a few days in Rome and then spend a few days in Florence. 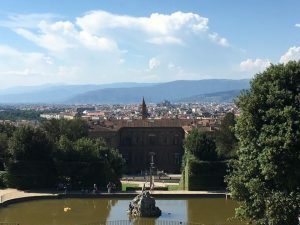 I picked Florence based on a general notion that this was a central location in the beginning of the Enlightenment. The trip out was fairly smooth, but there were a few minor bumps. We parked at the WallyPark airport service at O’Hare. I believe there had been a change in the international departure gate recently, so the driver deposited us at the wrong gate. So, we had to take the airport train to get to the proper gate. Once there, AirBerlin shares space with another airline — Etihad out of the United Arab Emirates. 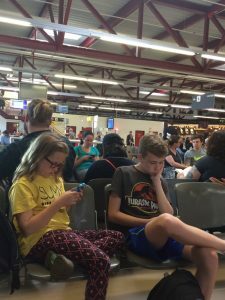 Ultimately, a good number of AirBerlin travelers had to wait in what amounted to a relatively cramped aisle way until the Etihad flight was taken care of. These hiccups can be chalked up to us not being very experienced international travelers. The 8 ½ hour flight east was tough on our systems — sleep is tough to come by in those airplane seats and having the night abbreviated is disorienting. Cole, in particular, seemed frustrated by his inability to sleep. We were all probably a little cranky by the time we landed. AirBerlin really likes to feed you: dinner and breakfast plus a couple of snacks. New to me: complimentary wine on the flight! Boarding the plane from Berlin to Rome. We landed at Tegel in Berlin and had a two hour layover. The airplanes exit from the front and back which makes the deboarding process much faster. You take stairs down from the plane to the tarmac with shuttles to the terminal. There was some issue with unloading the shuttles, so we were stuck there for longer than was comfortable. One fellow passenger joked that if the shuttle had had to go a few more meters, AirBerlin probably would have served us another meal. At this point, it’s probably worth mentioning that our family knows very little Italian and even less German. So, it was helpful to us that knowledge of English in these countries is very widespread. I shared with the kids my deep amusement (because I’m a nerd with a peculiar sense of humor) at the phrase “English is the lingua franca.” Lingua franca is a Latin phrase for “french language” (technically language of the Franks, I suppose) used to denote a universal bridge language which, at this point in history, is English. This led to a discussion about how Americans are generally very unlikely to know foreign languages when compared to the rest of the world. I cautioned not to draw the conclusion that this was because Americans were self-centered xenophobes. Rather, our country is very big, making international travel much more difficult and, furthermore, because English is the lingua franca, there’s not quite as much practical upside to us learning English as there is for people from other countries to learn English. That said, I would encourage anyone to get out of the country if they can because it expands your worldview and helps provide some context for evaluating our own country. The Tegel Airport in Berlin was a lot smaller than I anticipated for an airport in a major capital city. This post explains that the airport was constructed in a hurry during the Berlin airlift. There is a larger airport under construction in Berlin, but our conversation with the hotel manager where we stayed (more on that later) suggests that the project is a major boondoggle with a completion date that keeps getting pushed back. While we were in Tegel, I noted (for no particular reason) a few young Americans who struck me as being “of a type.” There was a couple who I (perhaps unfairly) characterized as crunchy hippie types speaking with a guy who was more of a guitar bro. He was playing them a few songs and they were nodding along at the profundity. I’m having a little fun with these descriptions, but I don’t want to get too carried away rolling my eyes at “kids these days.” If what they’re doing brings them joy, that’s sufficient reason for doing them. 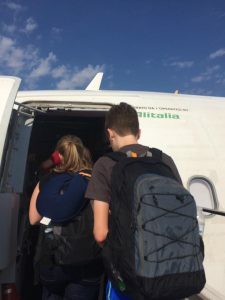 After a short layover, we boarded the Alitalia plane from Berlin to Rome. When we arrived in Rome, the driver for the car that had been arranged by the apartment rental place was at a different gate. So, there was a bit of waiting and exchange of phone calls involved in securing our ride. The traffic in Rome is chaotic. Lights and lanes seem to be more guidelines than rules. Smart cars, pedestrians, and scooters weave in and out of each other, mostly avoiding contact. But, we made it to the apartment we rented in Trastavere on Via Degli Orti d’Alibert, maybe half a block from the Tiber River. (It was a little longer to walk to the Tiber because there wasn’t a straight path from the place we were staying.) The apartment we rented was on the fourth and fifth floors of the building and had a pretty outstanding terrace on the roof. The kids did a good job of hauling their own luggage up the four flights of stairs. Lookin’ out my back door. (View from our apartment). There was a little shop a couple doors down from our building, so we went in. There was an old Italian grocer, straight out of central casting who didn’t speak a lick of English. So, it was a good first challenge for the road weary travelers. At first we couldn’t tell if he was telling us whether he was opened or closed. But, when I recognized that he was telling us that he closed at 4:30, that seemed to bridge enough of the communication gap for us to get things going. Part of the problem was that he wouldn’t let us just go grab likely products and bring them to the register. He wanted to get them for us. But, ultimately, we secured some wine, beer, meat, cheese, and bread and brought them back to the apartment. Then, it was nap time! We hadn’t slept much in the last 24 hours and everyone was feeling it. I’m not sure how much everyone else slept, but I got a few hours of much needed sleep, and we were ready to go see a little bit of Rome. 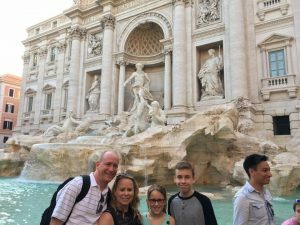 We decided to make the approximately 1.5 mile walk to the Trevi Fountain. Unfortunately, the Apple Maps app pretty quickly directed us to go straight through a wall. We were in a strange city and still getting used to navigating the narrow cobblestone streets where the had to crowd near a building wall when a car was coming past. We would quickly get used to this, and navigating the city wasn’t terribly difficult, but it did take some getting used to. We had read a lot about the prevalence of pick pocketing in Italy. We didn’t experience any ourselves, but we were on guard against it, so that added to the initial tension. Near the fountain (and really near any tourist attraction) there were lots of street vendors selling a random variety of things such as wooden bowls, fidget spinners, and selfie sticks. (But, despite the apparent randomness, the sales seemed to be the same 6 or 7 items throughout Rome and Florence.) The Fountain, like so much in Rome, really was spectacular. Wikipedia tells me that “Trevi” refers to three roads, and the fountain is the terminal point where an aqueduct brought water into Rome and served the city for 400 years. In 1629, Pope Urban VII came up with the idea of a sculpture that would make the site more dramatic which, after a long time, led to the project which was completed in 1762. We didn’t know all that at the time — we just appreciated the beauty of the place, being in the midst of the other site seers, and threw in our coins. 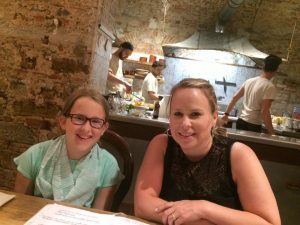 Our first dinner in Rome was at the Piccolo Buco, not far from the Trevi Fountain. There was a fairly significant wait to get in, but they handed out some free glasses of wine while we waited, so that was fun. We had no idea, but this appears to be somewhat common — something similar happened while we waited for a restaurant in Florence a few days later. Common or not, it made us feel special! The kids, who got nothing out of that deal, perhaps weren’t quite as content with the wait. But, ultimately the food was good. Harper was angling for some cheesecake that she didn’t get that night. However, her raising the subject prompted me to tell her the story of my oldest sister having a nightmare about cheesecake once when we were kids — as I recall, it featured little men (I always pictured them as being like Oompa Loompas) holding out plates and chanting “cheesecake, cheesecake.”. My other sister & I never let her forget it. Harper and Cole cracked up when I told them about it. After a nice dinner, we made our way back to the apartment. We were quickly becoming more comfortable walking around in the city. Next time: The kids wear their Sunday best for the Pope. I think I mentioned a few weeks ago that I was actively working on the school funding referendum for West Lafayette Schools. I’m not looking up dates, so I might get some of this slightly wrong, but in 2008 or thereabouts the State shifted the school funding model. Instead of coming mostly from local real estate taxes, most school general operations would be funded from the State’s general fund. This was partially in response to some more generalized property tax problems. (Here is a post from 2007 with some of the history to that date — quoting, in part, Everybody’s Favorite Economist ™ Larry DeBoer.) Almost immediately thereafter, the national economy hit the skids. The State cut school funding. In 2012 (I believe), West Lafayette’s school superintendent, Rocky Killion, wrote a column entitled “The Demise of Indiana Public Education” that speaks to the history as it pertained to West Lafayette Schools up through 2010. This history was echoed in a December 2016 presentation (pdf) by Dr. DeBoer. The upshot was that over the course of about 25 years, just about every decision made by the General Assembly in terms of school funding, sometimes by design / sometimes by happenstance, worked against West Lafayette schools. That said, the General Assembly did make available the referendum process as a tool to help West Lafayette right the ship. So, in 2010, there was a hard fought referendum battle on the question of whether to permit imposition of a local property tax increase of up to $0.43 per $100 of assessed valuation. A lot of money was spent on both sides. A group of local landlords were the primary opponents of the measure. But, after the dust settled, the community supported the measure by about 2 to 1. The money was well spent. West Lafayette has a lean administrative staff (probably too lean, truth be told) and our schools are consistently rated among the top (if not *the* top) school corporations in Indiana. I suppose the argument could be made that we could make due without referendum money and settle for average performance. But, as a community, we embrace education in a big way. I can’t say I campaigned that hard for my own school board seat. I should have done more. But, I had never campaigned for anything before (I had been appointed to fill out an existing member’s term) – and self-promotion isn’t something a Midwestern kid is raised to be comfortable with! The referendum campaign was very different. It was a lot more important than my board seat, I had just received a lesson on close campaigns (with the Presidential election — a lot of us are still receiving that lesson), and campaigning for an issue like this was much more in my comfort zone. A pro-referendum PAC called “Friends of West Lafayette Schools” was formed with some local dignitaries at its head. (For example, former West Lafayette mayor Sonya Margerum (Democrat) and former state representative Sue Scholer (Republican) were co-chairs.) Being a part of that effort was educational, gratifying, and enjoyable overall. I got to knock on doors with a number of people (including Sue) — which turned out to be something I unexpectedly got a kick out of. But my favorite co-campaigners were my kids. We had a data-entry app. I’d talk, and they’d thumb-in the results. I was able to meet or get to better know others involved in the campaign. Developing relationships is an underappreciated aspect of community efforts. 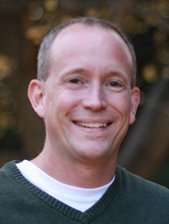 The community is strengthened not just because of the goal that is the focus of the effort. It’s also strengthened by the act of working together with your friends and neighbors. Ultimately, as the headline indicates, the school funding question passed in a landslide: 94.27% of those voting. Those are third-world dictator numbers! Of 2,233 votes cast, 2,105 were in support while 128 were against. I’m told that’s a state record of some sort. The strong support of the community is good to see, but it does strongly suggest that this effort was something of a waste: kind of make-work imposed by the state. There was no real appetite to eliminate the current tax rate. The burden is reasonable and the results of that funding have been very good. But, that’s all the complaining I’ll do for now. The result was very positive, I made some new friendships & strengthened some old ones, and I got to walk around my community while chatting with my kids. I’m definitely putting this one in the win column. 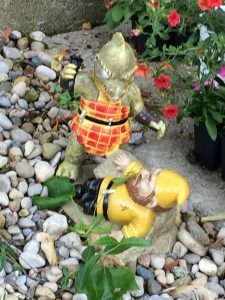 And, in closing, I’m sharing a picture of a Kirk-gnome being attacked by a wee-Gorn that I saw in a rock garden while I was canvassing. Kirk needed a little convincing to vote “yes” on the school funding question. I am going to engage in a bit of shameless promotion for a moment. 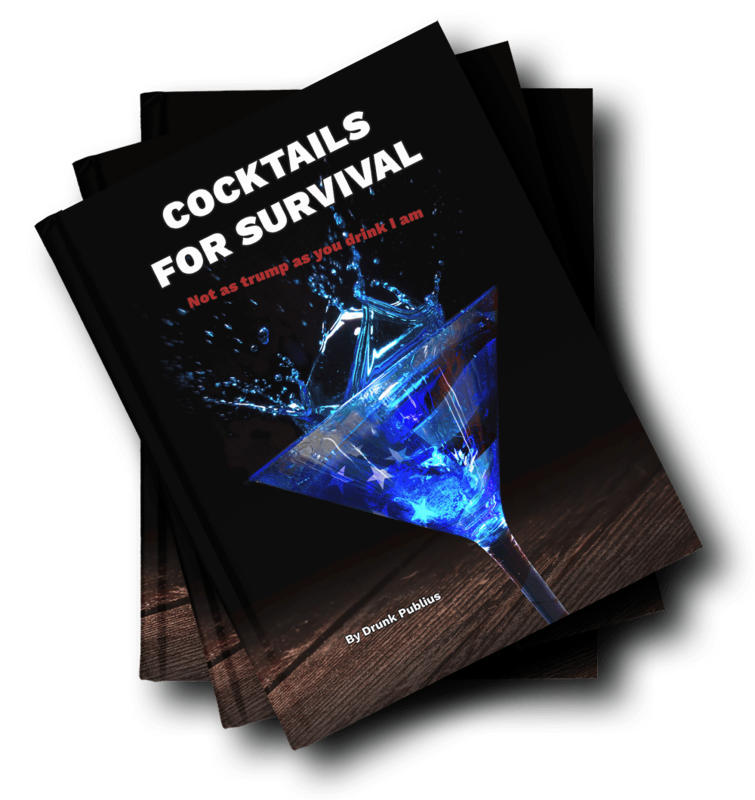 My family and friends have been involved in the Drunk Publius effort resulting in the creation of “Cocktails for Survival: not as trump as you drink i am.” It is a cocktail book that received some attention from the newspaper a few weeks ago, and is now available for purchase. If you love Trump, take a dim view of alcohol, and on the whole would prefer not to laugh, then this book is not for you. Otherwise, you might like it. It includes drinks like “The Wall,” “The Bad Hombre,” “Trumple Thinskin,” “The 400 Pound Hacker,” and many more. Maybe it would make a good gift to lift the spirits of a friend? Make a good centerpiece or an inauguration party (inauguration parties are a thing, right?) In any case, the idea is to get together with friends, have a few drinks, have a few laughs, and generally soften the blow of what looks to shaping up as a bumpy next few years. Putting the “Gallo” in “gallows humor,” so to speak. I heard, as it were, the sound of thunder. One of the four beasts saying, “come and see.” And I saw . . . the recipe for this drink. The original ingredients were pestilence, war, famine, and death, but we’ve made a few substitutions. Slouch your way toward Bethlehem with this refreshing drink. Pale horse optional. So, if it sounds interesting, drop by Amazon or TrumpedUpBooks.com to buy a hard copy or an e-book. And if you can pass it along to like minded friends, you’d really be doing us a solid.